Welcome back to Travel Trout Tours. This week we are on Calypso Island to visit the Surf Shack. Winding your way along the boardwalk, you will come upon an unassuming yellow bungalow overlooking the pristine beach. 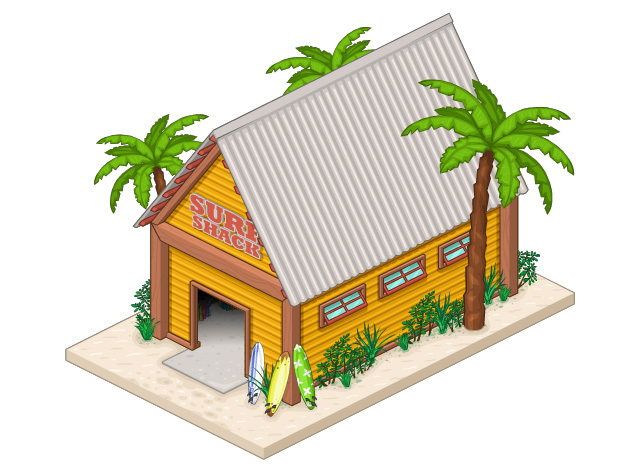 The large Surf Shack sign and wide open doorway beckon you into the shop. Here you will find the owner, Kahuna, waxing up a longboard for the next surfing class. His store has everything you need for your vacation on Calypso Island. A wide variety of Sundresses, Shades, Snorkels and more line the walls of the Surf Shack.